Get 24,000 Free Ultimate Rewards Points from OfficeMax! Edit: This deal actually goes until December 27th so you can get 50,000 miles or more! Edit 2: I found out today you can do 3X$200 to maximize the discount with $40 off. I have updated the review to reflect this. I love OfficeMax! They give me free money and miles all the time like when they gave me 1000 points a day and when they gave me 43,000 Ultimate Rewards points in just one week! This time it is 24,000 free points but it is possible to get even more! A little free time to stop by OfficeMax every day and then Walmart at the end of the week. What if I told you that if you gave me $580.85 that I would give you $600? And I would do it every day for a week. What if I threw in 3000 Ultimate Rewards points too? Sounds too good to be true, eh? Well it isn’t! 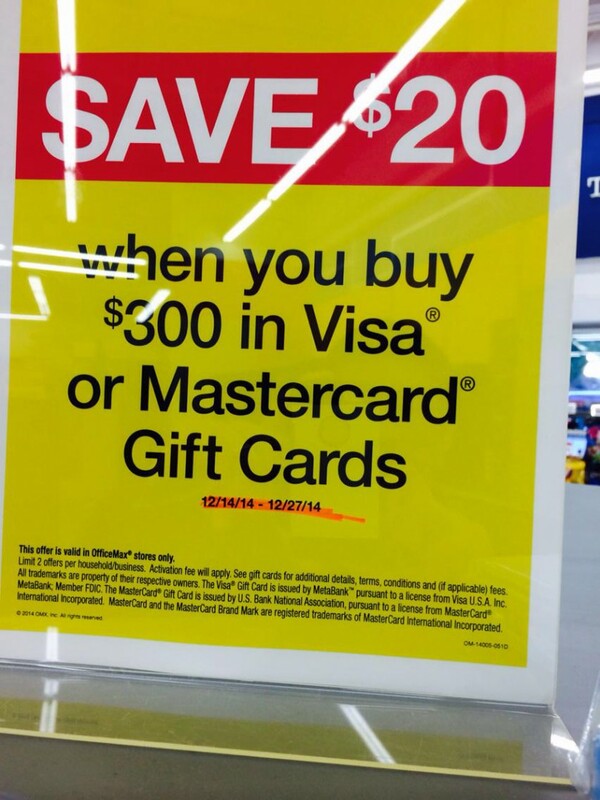 That is exactly the special OfficeMax / Office Depot is running until 12/27. Image courtesy of Frequent Miler! Thanks! Go to OfficeMax Buy three $200 Visa gift cards. After the scan the code from their sales book that they keep in a 3 ring binder the total should be $580.85. Pay with your Ink Plus card if you have one or whichever card will give you the most points. The MC will work as well as long as you are getting them from OfficeMax and not Office Depot. If you want to use them at Walmart for Money orders or Bluebird, I haven’t had good luck with the MC so try and find the Visas. The Visas look like this. Some of the OfficeMax will limit you to one deal per day but some will do more. If you have more than one OfficeMax close to you you can always drive around and get more per day. Then do an online bill pay in your Bluebird and pay off the credit card you used to pay for the gift cards. 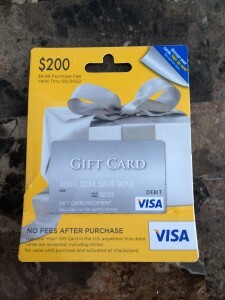 If you are able to swing by one OfficeMax all 10 days, you can get 30x$200 gift cards worth $6000 for a total cost of $5808. I know this sounds like a lot but the credit card will be paid in full by the end of the week. If you use your Ink Plus card you will get $5808×5 = 29,040 points! This is enough for a round trip flight anywhere in the US, or almost 3 flights from Miami to Cancun! Previous Previous post: US Airways Bumps Bonus to 50,000!